It's funny how our motivations change over the years. As a child I was motivated easily by candy. I would often tell people that there was no such thing as too sweet. I remember very distinctly when that all changed; yesterday, while eating an imarti which I have come to know as the sweetest thing I have ever tasted. It is really nice to have such a simple metric for knowing my state of maturity: I've grown up because I finally know that there is candy that is simply too sweet. I find myself every other week committing the act of what I would call quarter smurfing. As smurfing is the act of collecting pseudoephedrine for making meth, it isn't quite the right term for it, but what I'm doing is very similar. 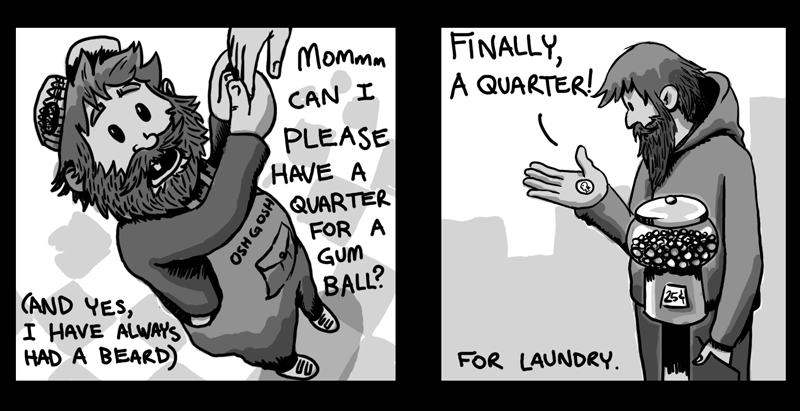 Every so often I need change to feed the laundry machine, so I leave my apartment on a quest to find 9 magic coins that will convert my dirty laundry into fresh, clean, wearable laundry. I get some cash and I procede to a series of coffee shops, selecting drinks that will yeild a little more than 75 cents in change. And while I usually try to make exact change (while still tipping of course), on a quarter smurfing day I guarantee you that I will not! One last thing: Whenever I tell stories of myself as a kid, a number of my friends seem to hold the same weird mental image of me as a little child, but still fully bearded. If you'd like to hear what that sounds like, click HERE.